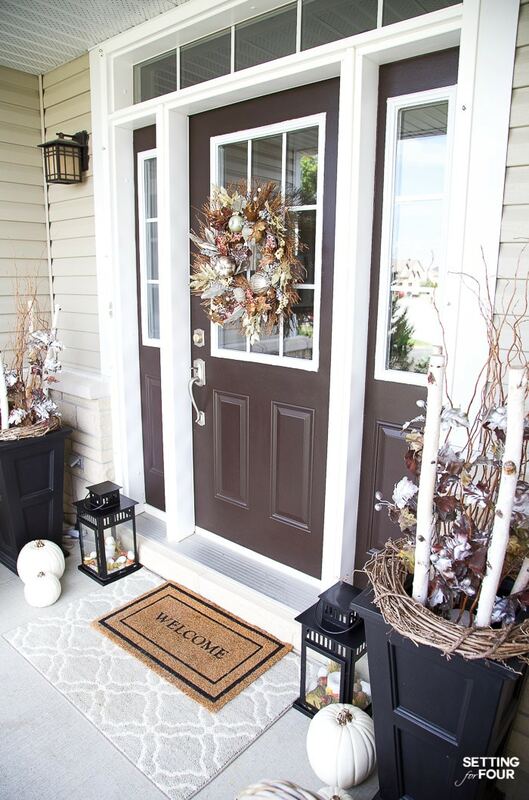 See these Simple Fall Porch Decorating Ideas With Big Impact! 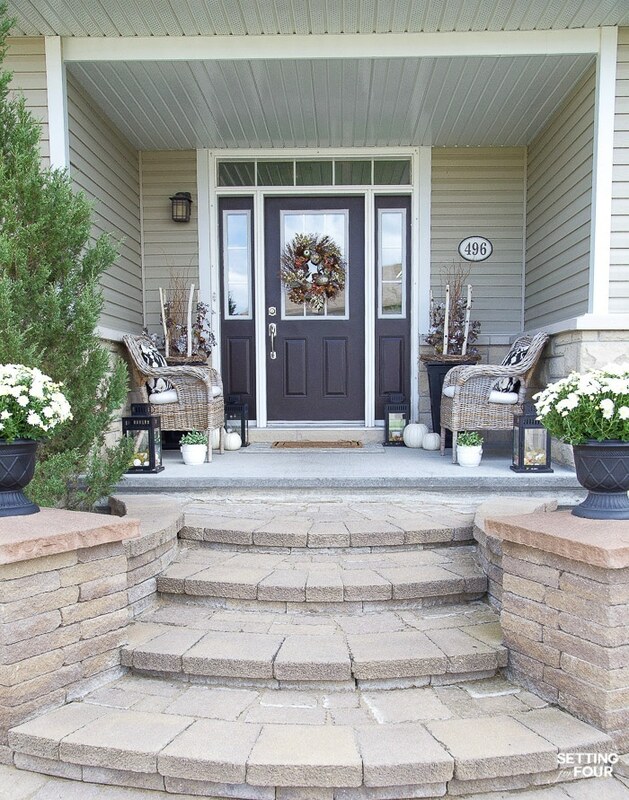 Increase your home’s curb appeal with easy decor ideas including pumpkins, fall leafy branches and potted mums. 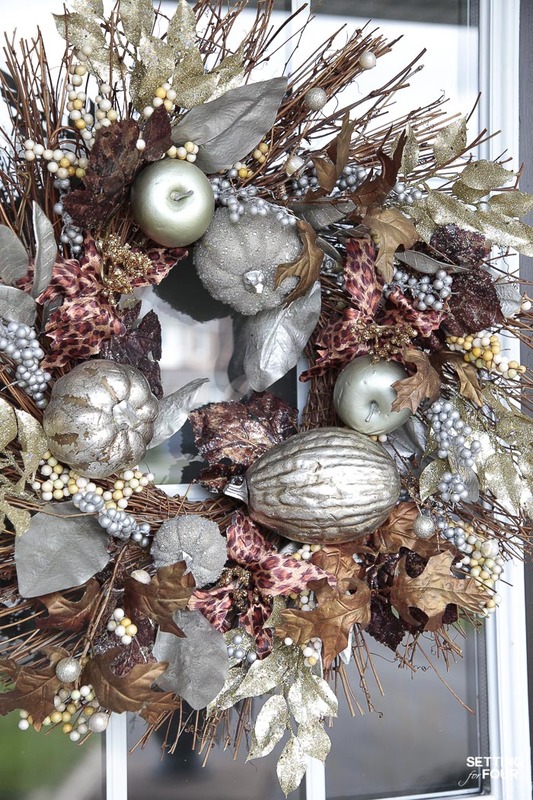 Use a wreath you already own and zhoosh it up a bit to make it feel new! 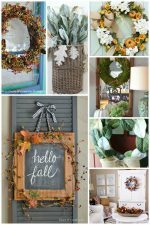 It doesn’t get any easier than using a wreath you already own and adding a couple of new fall decorations to it! I’ve had this glam fall wreath for a few years and I added 4 newmetallic leaf picks to give it a bit more fluffiness and sparkle. Pick your favorite fall plant or flower and add a couple of them to your front porch! My favorite fall flower are white mums with yellow centers so I added one big pot onto our front pillars. So simple! Ornamental cabbage, sedum, purple fountain grass, mums, asters. 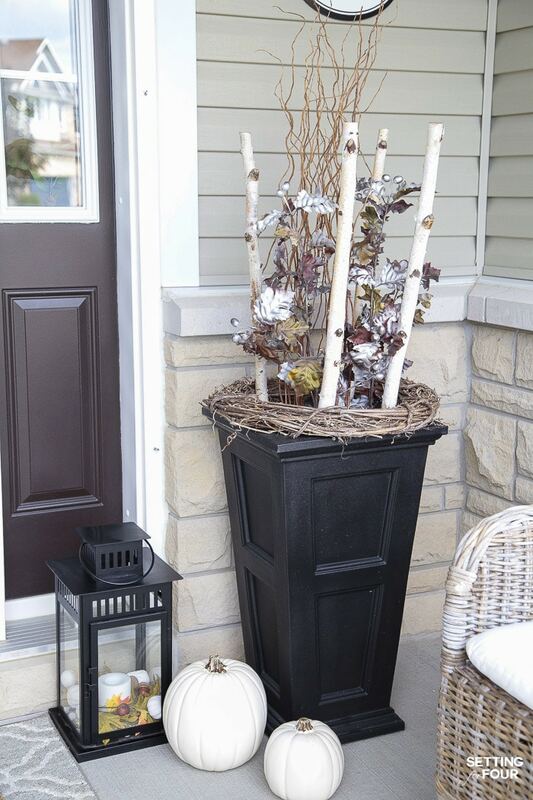 A bundle or two of corn stalks is a pretty way to add a fall look to your porch. Prop them up in a corner or place them in tall planters! NOTE: remove any cobs of corn that may be on them! I bought corn stalks one year, left the corn cobs on them and the raccoons and crows devoured them and made a huge mess! Want simple? 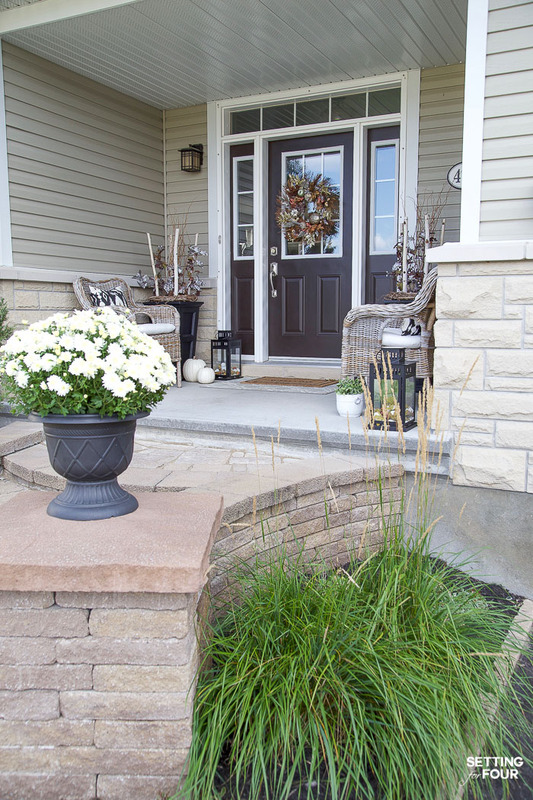 Use faux plants and flowers in some urns by your front door! 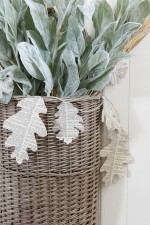 There are so many gorgeous faux leafy branches and faux flowers to choose from and they are typically inexpensive. 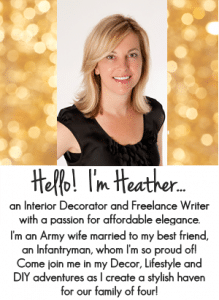 They can be used year after year so your decorating dollar goes so much further! I added these faux maple branches in silver, bronze and gold to my tall black planters that I’ve raved to you about before! 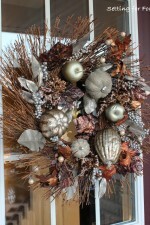 Mix them with real birch branches for a festive Fall look! Add extra lighting to your porch for a gorgeous glow at night. With the days getting shorter its so pretty to have extra lighting add a twinkle to your porch to increase your curb appeal! Along with my battery operated candles in my lanterns I have spot lights in my favorite planters that come on at dusk! They shine a gorgeous light up into the curly willow and its so pretty at night! Add waterproof copper battery operated twinkle lights to your front porch for a gorgeous glimmer! Drape them around your wreath or around a pumpkin display! 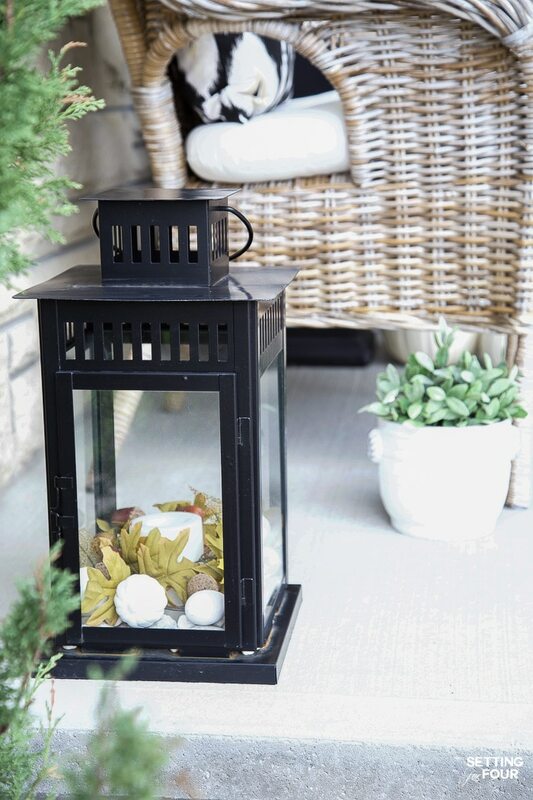 If you have space add some lanterns decorated with fall leaves, acorns and mini pumpkins! I bought a leaf garland and cut it into 4 pieces, placing each piece around the candle in my lantern. Then I tossed in a few white acorns and mini pumpkins. You could also add some fall garland around the top! Nothing says fall like pumpkins and gourds! I used my faux white pumpkins and scattered them around my front planters. You can use real or faux gourds and pumpkins in baskets or spilling down your steps to welcome Fall to the exterior of your home. Heirloom pumpkins in shades of blue, green and peachy pink add a fun look too! 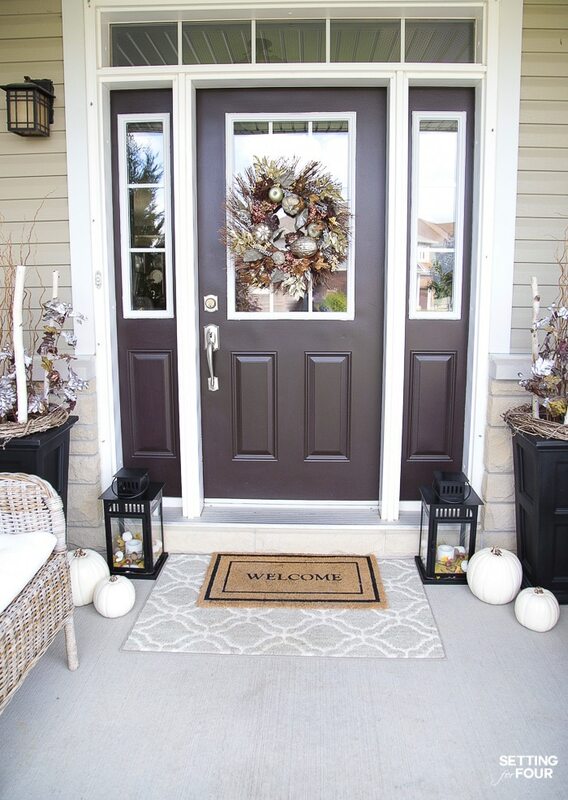 Add a small area rug under your front door mat to add some color and pattern to your fall porch! I love this 30 x 40 gray and white rug that I added under my welcome mat! 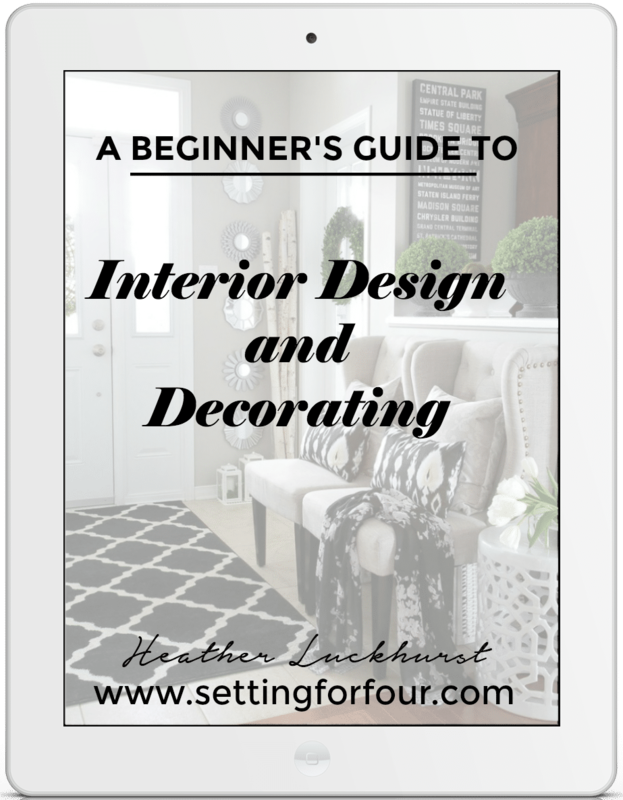 You could use a neutral color like I did or add a rug in a fall color like rust, goldenrod yellow or merlot. 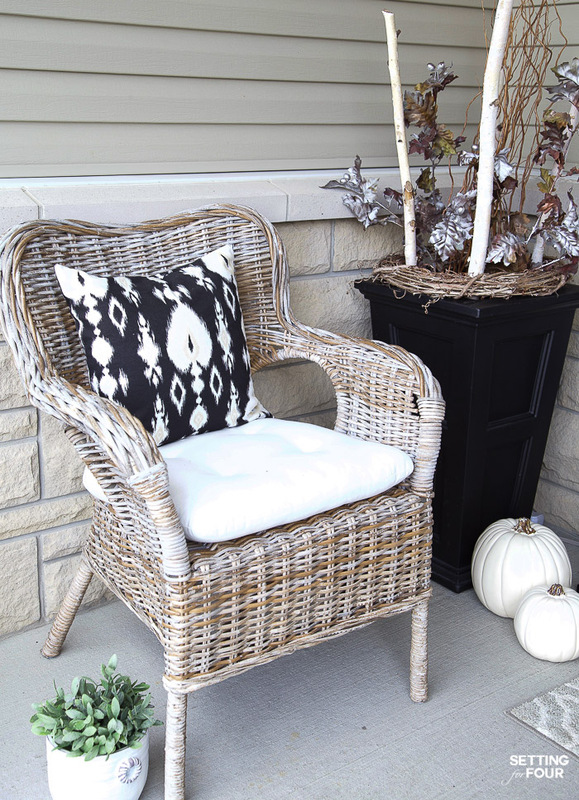 If you have seating on your front porch add some pretty fall pillows! 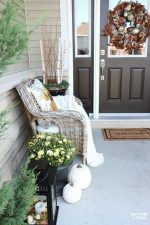 I still love my 5 minute DIY pillow covers that I made this summer and love how they look on my autumn porch so I kept them for fall. There are lots of beautiful, affordable fall pillow covers here. SHOP THE LOOK! CLICK ON THE IMAGES BELOW TO SEE MORE ABOUT EACH ITEM! I love the simple additions you have added for fall. Isn’t it so fun to decorate for each season? ha..thanks for the tip on about the corn. I actually left some wheat in the garage and it totally invited mice in…ugh. I love your Fall porch, it is so in season. I love how you filled your lanterns, that is so creative! 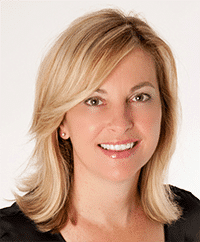 So beautiful, Heather! Love your style! Hope you’re having a wonderful week! Thanks so much Abby! So glad you like it!